Lab pipettes will not deliver and measure accurately or they may contaminate reagents if they are not cleaned. Their narrow tubular shape is difficult to clean. Use a siphon pipette rinser with Alcotabs® Tablet Pipet Detergent. Presoak pipettes in a 1% Liquinox® Critical Cleaning Liquid Detergent solution (10 mL/L) as soon after use as is practical so as to avoid drying out the pipettes. Collect a basket-full of presoaked pipettes for the rinser. Do not use the presoak solution for more than 2 weeks. Put 2 Alcotabs tablets in the bottom of the washer rinser, cover with the basketfull of pipettes and turn on the water. 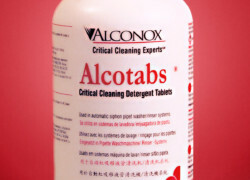 The Alcotabs detergent slowly dissolves over the course of about 10 cycles, then allow continued rinsing for 30 cycles. 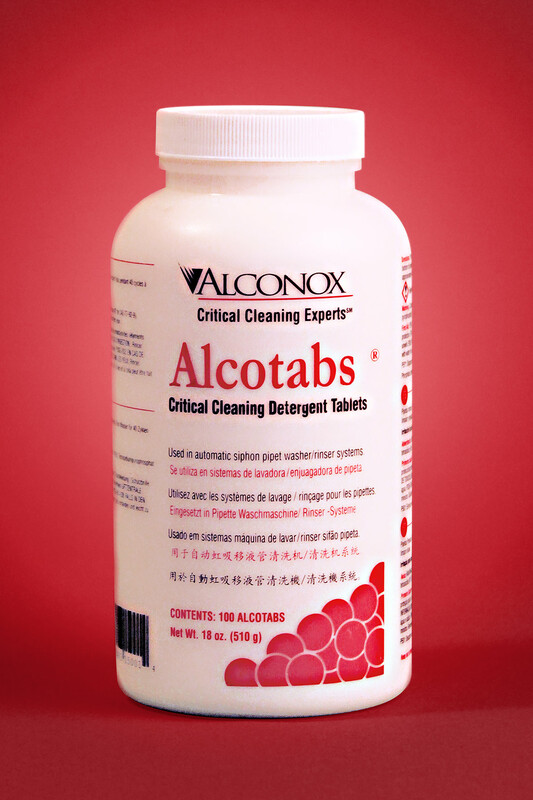 Alcotabs tablets gives circa 10 cleaning cycles while the tablet slowly dissolves as compared with a simple powder or liquid detergent which will run out in the first cycle as the washer empties.